Hot temperatures are hard to deal with if you don’t have any means of decreasing the temperature. One excellent way of doing so is by getting the best ventless portable air conditioner for your home. A lot of people often confuse a ventless portable air conditioner as a simple portable AC unit or a ventless AC. The truth is this one is a blend of both: it works without a hose and is portable as well. Therefore, it’s a ventless portable air conditioner. This ductless AC uses a water tank to cool warm air and pass it through the fan. Apart from that, these AC units are super lightweight and can be moved from room to room with great ease. Without much ado, let’s find out the top 3 ventless portable air conditioners on the market. This is a 2-in-1 ventless portable air conditioner that serves as a tower fan and a humidifier. It offers excellent coverage with a bunch of incredible features. 2-in-1 ventless portable AC unit. Covers an area of 650 sq.ft. Offers 3 wind modes and 4 fan speeds. Cooling Coverage: One of the most important factors that decide how strong an AC unit is the cooling coverage it has. Luma EC220W covers an area of 650 sq. ft., which equals to a 1.5 ton AC. One unit will be enough for such a big space. Fan Speed: This unit offers four fan speeds that deliver up to 650 CFM of cool air. The lowest speed is the best if you want it to operate silently. You can also add ice packs to make the fan give out cool air. This can be a good option for very hot days. The fan is said to make you feel about 8 degrees cooler (at max speed). Water Connection: Since this unit works on an evaporative cooling technology, it requires a water-filled tank to chill the room. It has a large 10.6-gallon water tank that is super easy to refill. You can pour water from the top or bottom and even detach the water tank to clean or refill it. You also have the option to fill the tank by directly connecting a water hose. Performance: Luma Comfort EC220W High Power 1650 CFM Evaporative Cooler with 650 Square Foot Cooling stands tall when it comes to the overall performance. It has a powerful blower that draws in outside air, passes it through three cooling pad, and pushes out cooler air. Other than this, it’s also able to catch airborne particles and give out fresh and healthy air. UV protected ABS plastic doesn’t corrode. Uses 80% less energy than conventional ACs. The tank will last for 24 hours easily. Equipped with a water level indicator gadget. Extremely lightweight (42 pounds) and easy to move thanks to wheels. A bit louder at full speed. If you are looking for a superior ventless portable AC that can eliminate the dryness and humidity from your room then pick Luma EC220W. Thanks to evaporation technology, it can be a good pick for dry states. If you want to cool a small indoor space without using up too much of power then bring home Honeywell 525 portable cooler. It’s a low- noise generating unit that is capable of chilling a dry and humid room in a few minutes. Regions that experience less than 60% humidity should definitely consider this AC. Uses only 52 watts of power. Equipped with a low water alarm. Power-Saving And Powerful Unit: This is a power-saving ventless portable AC that lowers the temperature in no time. It offers three fan speed options. You can choose the lowest speed if you want it to operate silently. While the unit is powerful, it is meant to cover smaller rooms only because it delivers 525 CFM of cooling air. Longer Runtime: It incorporates a 7.9-gallon fuel tank that provides with hours of operation. It also has an alarm system to inform you when it’s time for a refill. Portable And Easy To Use: It comes with a remote control that makes it easy to operate the unit. It’s quite portable at 25 pounds and has wheels as well for added portability. Performance: The unit may cover a small area but its performance is top-notch. You can also place ice packs to make the air more chilly. It has an ice compartment for the job. You can also connect a hose directly to refill it, making the job easier. Programmable: You can also program the unit to work for up to 7.5 hours using the timer. This is a great feature when you want to sleep or work without having to worry about the AC. Customizable thanks to features like body-level air throw and humidity control. Suitable for small-medium places only. 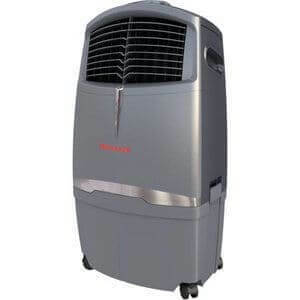 Honeywell 525 CFM Indoor Outdoor Portable Evaporative Cooler with Fan And Humidifier, Washable Dust Filter &amp; Remote Control, CO30XE can be a great pick for small to medium rooms. It is remote operable and also allows to set it on a timer so that you don’t have to wake up in the night. 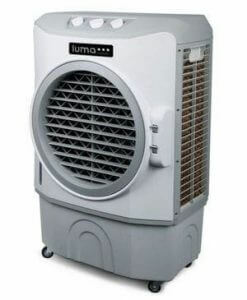 If you are looking for a portable evaporative cooler that can chill the room like a pro then Luma EC110S is your best bet. It’s the most effective when it comes to bringing down the heat as it can reduce room temperature by up to 30F. A cooling range of 250 sq. ft.
Customization: You can choose the speed and wind mode as per your requirement. It offers 3 wind modes along with 3 different fan speed options. You can start off with the max setting to make the room chilly and then reduce it to make it run silently. Top Notch Cooling Tech: The unit operates on a cyclonic cooling technology that’s known to be quick. You will not have to wait for hours for the room to feel cooler. However, this unit is only suitable for smaller places because it can only cover up to 250 sq. ft. of space. Performance: The unit looks good and performs exceptionally well. Evaporative cooling makes you feel comfortable by not only reducing temperature by also making the air fresher. Thanks to a unique design, the unit works silently and will not cause any disturbance. Energy Saving: It consumes 75% less energy than standard AC units. Moreover, it also has a timer to save energy. Detachable water tank is easier to fill and clean. Not suitable for humid areas. Luma Comfort EC110S Portable Evaporative Cooler with 250 Square Foot Cooling, 500 CFM can be a good option if you live in dry and hot areas. It works well for small rooms but may not be suitable for larger spaces. How To Choose The Best Ventless Portable Air Conditioner? You need to consider a few steps in order to choose the best ventless portable AC for your home. First, determine how much cooling coverage is ideal for your room. This will require you to measure the room area in square feet. The unit should be able to cover the entire space to ensure every corner of the room is comfortable and cool. 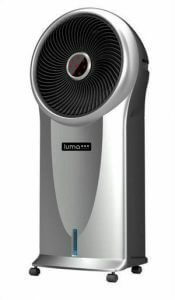 Luma Comfort EC220W, for example, can be great as it offers excellent coverage. This is important as some units only offer about 3 hours of run-time, which may not be enough. Pick a unit that offers at least 8 hours of run-time so you can sleep without worries. The size of the tank plays a very important role here. It can be frustrating to wake up in the middle of the night to take care of the cooler. You can avoid this by choosing a unit that has a timer option. You can set it to shut down automatically to save energy and reduce effort. Other than this, pick a unit that sends low water alerts so that the unit does not have to face any burden as running ventless ACs when the water level is low can be bad for the unit. Honeywell CO30XE 525 CFM can be a good pick, it has a remote control and an alert system as well. This is important so make sure to pick a unit that offers excellent performance. Some factors that can influence the performance include customization options (fan speeds), the ability to use ice, etc. Consider how easy it is to use a unit. Some offer detachable tanks for added ease. Plus, some ACs even come with remoter controllers so that you do not have to move every time you want to change settings. Luma Comfort EC110S 500 CFM can be an excellent pick as it offers good performance and is customizable as well. You do not want to go for a unit that’s too noisy. It will disturb you and cause you to feel irritated so pay special attention to the level of noise a unit creates when operational. In the end, choose a ventless portable air conditioner that fits your needs. All the three options discussed above are great, pick one that suits you the best.